In Gear! The Holy Black Trading Co. Home | About Us | Opportunities | Sponsorships | Contact Us! Alright manly men, this review is for you! Last week we received an amazing sampling of men’s handmade shaving gear from The Holy Black Trading Company, and we’re thrilled to be sharing it with you today. The Holy Black is a brilliant shop that offers up some of the most raved-about shaving soaps and aftershaves around, and we’re definitely part of the fan club. In this week’s In Gear review we’re going to introduce you to just a few of the great shaving gear items from this amazing artisan shop… enjoy! 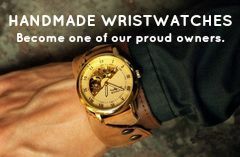 What catches the eye first when perusing The Holy Black Trading Company Shop online store is the look and personality of their product line. It’s a combination of Old West Barbershop and vintage nostalgia tailored to the man who lives right here, right now. The styling is truly one of a kind and it speaks accurately about the overall experience you’ll get from the products themselves. 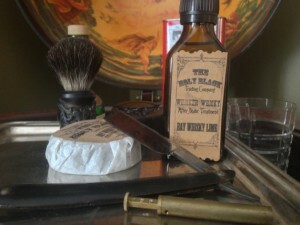 The Holy Black Trading Company currently proffers a complete line of traditional-style shaving soaps that lubricate and hydrate the skin while you shave, and some artisan aftershave blends that soothe and surprise. 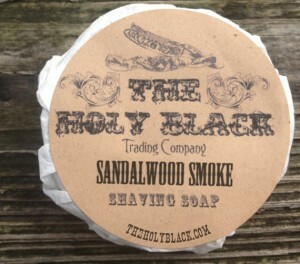 When shopping at The Holy Black Trading Company, you have several unique shaving soap scents to choose from, each made from top quality ingredients that hydrate and soothe the skin for the perfect shave. The same scents are available in their aftershave line so it’s easy to get on board with a signature shave with one-of-a-kind fragrance. The soaps are soft, perfectly lathered, easy to rinse off, and really effective with a straight or safety razor. If you think that creams and gels packed with chemicals are the only way to get a smooth and soft shave – think again! The aftershave offered by The Holy Black Trading Company is made from nourishing ingredients that include real whisky as an astringent and alum to help stop any bleeding. Sheer genius! They go on well, the scent lingers for hours in a subtle and enjoyable way, and they work really well with the soaps as a single daily shaving protocol. Like the name implies, this is a masculine, grounded, woodsy, and smoky blend. The scent is deep and brooding while not being aggressive or overwhelming. This scent is clean, light, invigorating, and masculine. There are gentle hints of pine and fir that make the concrete jungle feel like a woodland forest, and the deeper notes have a comforting scent that lasts for hours. What happens when a perfected version of the classic bay rum scent meets cooling lime? Bay Whisky Lime! This fragrance brings up the classic bay rum scent but adds more energy and invigoration in with the crisp lime. This is a great option for any guy who doesn’t love their morning shave because it’s sure to wake you up and start you out with a smile. It turns out that smoky and spicy make the perfect shaving combination – and the most intriguing and attention-getting scent to have lingering around your mug all day long. This is sure to become a classic fragrance blend because it is completely unique and blends classic comfort scents with a twist that will surely please! 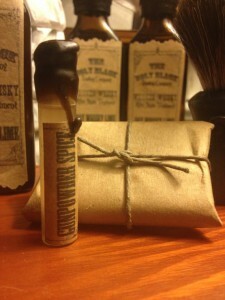 Keep your eyes open for their sample kits and unique shaving brushes! 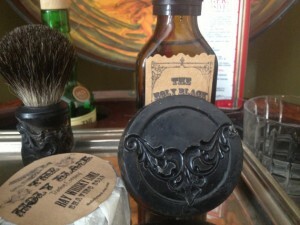 Tagged aftershave, shaving, shaving soap, The Holy Black Trading Company. Bookmark the permalink.